Project management documentation is critical to the success of a construction project. A documentation system that allows for easy document filing and quick retrieval means that it will be used. And we all know that the project documentation system used is the best system. PM-File is Free to Share! PM-File the Project Management Documentation Filing System for construction projects was developed to be easy to use and effective. It is successful with both small and large projects alike. It’s simple, incremental, easy to learn and very effective at recording the design, construction, and change sequences that occur within the duration of a project. Most importantly, the PM-File Project Management Documentation Filing System keeps track of consultant, contractor and vendor responsibilities, deliverables and deadlines. PM-File is an incremental method filing system that effectively helps the experienced project manager or owner’s representative. Because of its simple, repeatable fashion, it is easily learned by and teaches the novice good, solid project management skills. It seems like a stretch to call it a “system” because of its simplicity. This system was first used with document hard copies, but is equally useful with electronic documents as well. It’s a filing system used as PC, Mac or hard copy file folders or even as tabs in a 3-ring binder (where we started with it) where project management documentation is categorized and recorded leading to very quick and easy retrieval when needed. The system is based on the premise that each individual contract between the owner and all designers, consultants, contractors and vendors is treated as its own sub-project. This is distinctively different than systems that divide a project into task-based categories, such as the familiar 16- or 50-division specification format. The contract basis of project division reflects the fact that all costs of a project flow through agreements, and those contracts define an individual scope of work, schedule and payment requirements. The sum of all the sub-projects (in other words the sum of all contracts) is what creates the project. 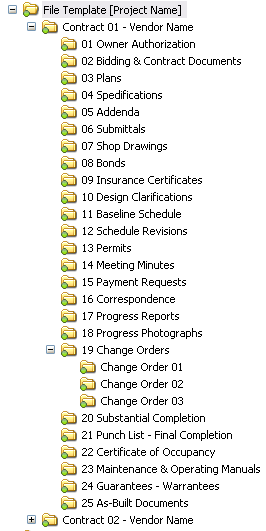 Each sub-project is broken down into common categories and project documentation is recorded into each category. A primary benefit of tracking a project through this method is that the PM-File System aligns itself with the requirements of an owner’s decision making, project accounting, and project purchasing systems. Rather than the traditional method of organizing a project by task and afterward grouping vendor contracts under a task, this system organizes the project by each vendor contract which then defines the tasks under the contract. This subtle difference greatly simplifies the tracking of each project contractor and each project task due to the inherent requirements of the individual contract. For every construction project, each contractor or vendor contract is given its own scope of work, schedule and payment requirements as identified in the agreement. An owner’s accounting and purchasing system is set up to create, track, and close out individual contracts – the same method as the PM-File Project Management Documentation System. This system of construction project management documentation provides a detailed and permanent record of the construction project. By ensuring that each of the project’s contracts, here called sub-projects, are managed and accordingly fulfilled satisfactorily, risk of construction related claims is lowered. How was the PM-File System developed? The idea for the PM-File project management documentation system was sparked back in 1995 by a list developed by author Andrew M. Civitello, Jr. in his book Construction Operations Manual of Policies and Procedures , second edition. (This link takes you to amazon.com for the latest edition) This book is a great resource for anyone interested in becoming a better construction project manager. The PM-File system consists of saving project documents and records of construction events into easily retrieved categories of deliverables common to all construction projects. The PM-File system breaks down the construction project into individual sub-projects that are made up of, and governed by, their own individual contracts. Each contract or agreement (here called a sub-project) has its own scope of work, schedule, and payment requirements. These requirements are managed as the building blocks of the Project Management Documentation Units. We are offering this PM documentation system not because we think we know it all, it’s just that this system is so simple and successful at Prince Engineering that we think it’s too good not to share. We just ask that you return here with comments, suggestions for improvements, or offer to share something you've developed. Effective project management is just part of good practice. We hope that all project managers have as much success as we have with this project management documentation technique. We are always looking for simple and better systems, techniques, and knowledge that can help us do a better job for our clients. We would love to learn what you have to offer. For example, have you found a simple process to complete a complex project management or engineering task? What’s your story? Everyone has something to share. If you find that this system is useful, please offer a comment at the bottom of this page, name a favorite program or book, or something else to share that can help others to perform their project management job better. This windows folder template is perfect for those who use Microsoft Windows for project files and file sharing. Simply copy this template to your project folder and you’re off and running! May we use your comments of support on our website? Please contact me before you use it. Prince Engineering, PLC successfully manages construction projects ranging from $5,000 to over $50 million (USD). We have been on all sides of the construction process including design professional, project manager, contractor, owner’s representative and owner. Prince Engineering has an excellent track record of project management and owner’s representation services. Call Prince Engineering at (888) 418-2695 and see if Prince is a good fit for you. Send us a message! (This link takes you to the email contact form) or simply call for discussion and answers. We’re inclusive, not exclusive. That means engineering and project management is done in a way that’s easy, understandable and productive. You’ll enjoy what you can build with Prince Engineering, PLC.